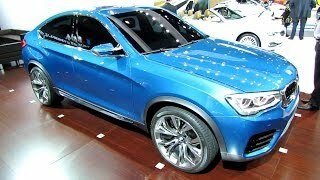 BMW has officially unveiled the BMW X4 Concept ahead of its public debut at the 2013 Shanghai Auto Show. The X4 Concept carries the attributes of a Sports Activity Coupe into a further vehicle segment; taking to the stage sporting a product character all its own. 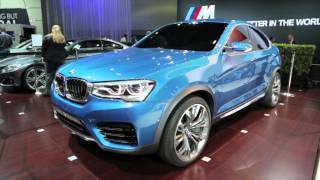 The X4 Concept follows in the tyre tracks of the BMW X5, BMW X3, BMW X1 and BMW X6, which likewise adopted the role of trailblazer in their respective segments and continue to set their class standard today. 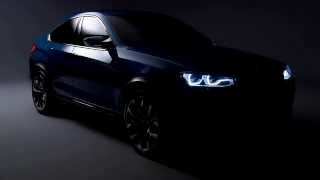 The sporting character of the BMW Concept X4 is articulated by its dynamic linework as well as its proportions. Its exterior dimensions signal sporting elegance and powerful robustness. In addition it comes with a long bonnet, short overhangs and set back passenger cell, long wheelbase and 21 inch light alloy. The rear of the BMW Concept X4 takes the sporting, width-accentuating elements of the front-end design. The body’s lines and the slim LED tail lights positioned at the outer edges of the rear emphasise the muscular wheel arches and wide track. Below, horizontal lines split the rear visually into sections, while light surfaces reduce the car’s visual height and underline its width. BMW hasn’t disclosed what would sit under the hood of the concept, but it is expected to offer a TwinPower Turbo 2.0L four-banger with 240 bhp (179 kW) and 260 lb-ft (352 Nm) of torque as well as a TwinPower Turbo 3.0L straight-six with 300 bhp (224 kW) and 300 lb-ft (406 Nm) of torque.